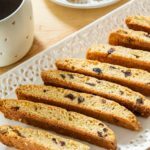 These Orange Cranberry Biscotti are spiced with cinnamon and cloves, and studded with dried cranberries and orange zest. Combine the flour, baking powder, cinnamon, cloves, salt, and sugar in a mixing bowl and whisk to combine. Add the butter and eggs and mix together with a sturdy spatula, until combined and clumped together into a dough. Gently mix in the orange zest, cranberries, and pistachios, until evenly distributed. Divide the dough in two and place on the parchment lined baking sheet. Shape each piece into a rectangle, no longer than 4 inches in length, and about 1" thick (and for reference, mine were about 10" wide, but width doesn't matter). The dough will spread as it bakes. Bake for 35 minutes until the edges start to brown slightly. Turn the oven down to 325F and take the biscotti out. Let the biscotti cool on the pan for 15 minutes, then slice with a sharp knife vertically into 1/2 inch thick pieces. Let the knife do the work for you, and use light pressure so the cookies don’t break (and if your dough tears, let them cool for 5 more minutes). Place the biscotti slices back onto the baking sheet cut side up and bake for 25-30 more minutes, flipping the biscotti halfway through, until they are golden brown and crunchy. Let the cookies cool completely before enjoying. This recipe is adapted from James Peterson's recipe in his Baking cookbook (affiliate). These cookies are easy to make by hand, simply with a whisk and a sturdy spatula. However, you can also make these in a food processor, briefly processing the dry ingredients, then processing in the eggs and butter, and then mixing the the cranberries, pistachios, and orange zest by hand, so the cranberries don't get sliced up by the blade. You can also make these in the stand mixer using the paddle attachment, or with a hand mixer.